The first time I laid eyes on Harvey Glanzer was Valentine’s Day morning, of 2002. A small, indistinct silhouette, he emerged to greet us from the dimly lit living room of the Willey House in Minneapolis. Outside, a bitter February was ever so slightly tempered by the rising sun. But inside, the climate was that of a glacial cave. Harvey struck me like J. R. R. Tolkien’s Gollum, perfectly at home, prowling around its bone-chilling recesses. This occasion was my wife Lynette’s first foray into the house, while Tim Quigley and Bob Davis, board members of the Willey House Foundation, a 501(c)(3) nonprofit comprised of architects, historians and preservationists, had hosted me months before. The foundation banded together with the intention of restoring the residence, and converting it to a house museum and community resource, a plan Harvey initially supported but eventually unraveled for them. My first visit was in early December of 2001. It was Tim and Bob who warned me of the irascible Harvey: “Cross him once and he’s done with you,” they cautioned. Harvey Glanzer was suspicious of anyone who wanted to get their hands on one of his properties. Stafford Norris warned me too, about this cantankerous old guy, who told someone pestering him on a tour Stafford attended, that he’d sell the house alright, for “one dollar a brick!” With that story in mind, in that morbid setting of the derelict house, Lynette made herself obvious counting bricks, as I regaled Harvey with my rudimentary knowledge of Frank Lloyd Wright. The meeting that morning was arranged though our family friend and realtor, Russ Fierst. We were scheduled to convene at 8AM but Harvey, dizzy with anticipation, confusion, some combination of the two, or just because he was Harvey, arrived at 7AM instead. His tiny figure sheltering in the impossible cold of the house, neither heated nor electrified, a long hour prior our appointed time, in the dim of a bleak, midwinter’s dawn. There he stood, just over five feet tall, age 86, encircled by the gloom of the house, a structure undeniably abandoned and in a profound state of material disarray. Despite the dull stench of the upholstered chairs, the console TV braced against one of the French doors, the sheets of translucent plastic tacked over every window and door, it was evident he had been tidying up for us. 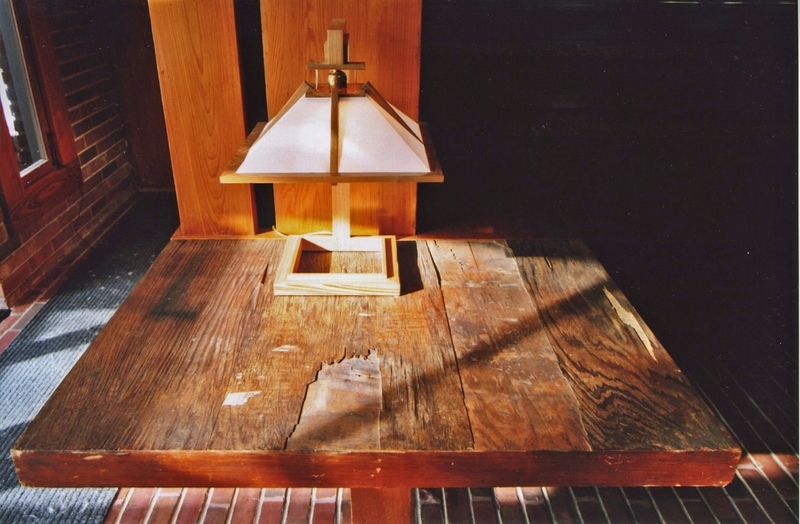 I recall a length of decorative fabric he draped over the original end table, whose veneers were terminally warped by a deluge of drip water, disguising its tall, wooden waveforms. Fallen plaster that crunched underfoot on my first visit, beneath the length of the entrance soffit, had been lovingly swept into the radiator pits, the ones with the collapsed gratings, no longer protecting the unwary from certain bodily harm, should one step there. It was on this stage we attended our initial interview, and Harvey could not have been a more amiable inquisitor. Shivering, we spoke for what felt like hours, in the cold light of morning, warmed only by the glimmer of hope that we might somehow acquire this ruinous gem. Then and there, on that mildewed spot, our curious relationship with Harvey Glanzer, the preservationist, began. Harvey and Beth entertaining at the Willey House, circa 1990s. These recollections of Harvey are a reflection of my own personal experience. I’ll admit they may not coincide with the views of others. The man burned every bridge he ever crossed, derailed every previous restoration effort at the Willey House, and left his collaborators, who usually did all the work, utterly discouraged. Harvey was fascinating yet deeply flawed. If personalities have facets, Harvey’s was the Hope Diamond. Sadly, the occasional hints of sparkle he cast upon us did not always illuminate others. In no way should these words be the last on Mr. Glanzer, but my account will hopefully shed some light on the inner man and his self-definition as a preservationist. Also, how we, the Sikoras, came to own the Willey House, and the mutual respect we all developed for each other in those early years. Harvey was hitched to a common law wife. Her name was Beth Caulkins. Beth was Harvey’s better angel, as they say. She is essential to this story because she compensated for many of the character flaws embodied in Harvey. Beth was a shining light, sweet and shy, with excellent taste. In personality, Beth seemed the polar opposite of the man. They met while she was working as a secretary at one of his many career posts. And later she became proprietor of a stylish gift shop in the Dinkytown neighborhood of Minneapolis. Her store, Bonnard-Printz, Ltd., well ahead of its time, specialized in fine arts and crafts, Scandinavian design, furniture, furnishings, global textiles and artisan jewelry. By the time we met, she had closed up shop in the Twin Cities and most of her inventory was moldering in a subterranean grotto beneath the A.D. German Warehouse in Richland Center, Wisconsin. 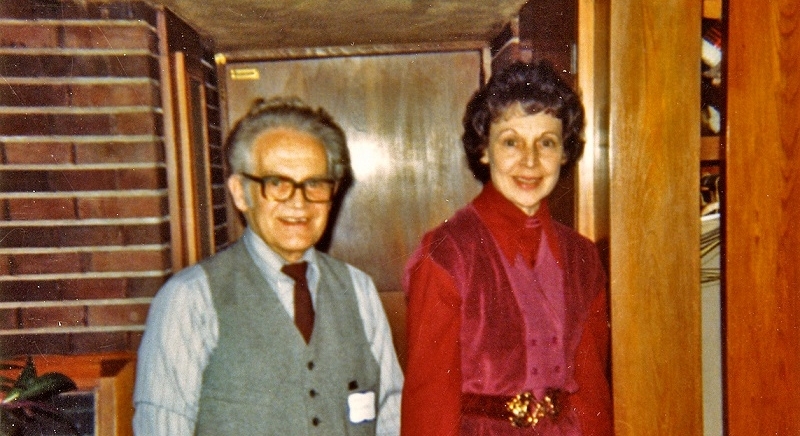 In 1980 Harvey and Beth became co-owners of the only Frank Lloyd Wright-designed warehouse. Longtime former Taliesin apprentice John Howe was engaged by Harvey to re-establish the A.D. German Warehouse as a tourist attraction in the town of Wright’s birth. Howe designed the elaborate gift shop on the ground floor, in which Beth displayed her wares for a number of years. Howe’s ideas appeared to be partly influenced by Wright’s own 1935 remodeling plans for the building. Ultimately, it was the allure of the Warehouse and its potential as a destination that drew Harvey’s attention away from Minneapolis and the Willey House, which lead to its downhill slide, which in turn led to us. There he stood, just over five feet tall, age 86, encircled by the gloom of the house, a structure undeniably abandoned and in a profound state of material disarray. Harvey was a believer in long courtships. He and Beth had been united in unwedded bliss for over 50 years. During what we came to understand as our own courtship, Lynette and I met with Harvey over umpteen breakfasts, usually at a local Perkins on Riverside. Chatting like neighbors over a backyard fence constructed of buttered toast, he wanted to know everything about us—our business, family, life experience, finances and especially, what we knew about Frank Lloyd Wright. Russ, our resolute and incredibly patient realtor, met with him as frequently as we did, perhaps even more often, since Russ always paid for breakfast at the Egg and I. Russ approached Harvey as a formidable challenge, and drew on long experience to outwit his wily quarry. From the start, his strategy was to address Harvey as “Mr. Glanzer,” a conspicuous sign of respect. Harvey probably saw through the ruse, but reveled in it nevertheless. At breakfast interviews, Harvey would recount his career, share family photos, talk about his vision for the A.D. German Warehouse and discuss pretty much anything other than the Willey House. “Mr. Glanzer” soon invited us to pay him a visit at the Warehouse. So, in March of 2002, Stafford, Russ and I drove down to Richland Center, Wisconsin. We arrived to find Harvey on a rooftop, shoveling snow off one of the upper balconies. Upon his descent, he led us on the full, arctic tour, escorting us through the building, bottom to top, accessed by an un-enclosed internal staircase. When he swung open the door to the uppermost floor, a flock of pigeons inside scattered in all directions. “Damn pigeons keep breaking in!” Harvey cursed. It seemed he was giving the feathered interlopers more credit than they deserved, when window glass would have been a perfectly adequate deterrent. Every object on display, as well as the exhibit walls themselves, was peppered, to some degree, in pale streaks and mounds of bird drip. How this could be, in a building with so few doors or windows, was beyond comprehension. Likewise, how some of these remarkable artifacts found themselves in such a pathetic state was as inconceivable as how they arrived there in the first place. It was never explained exactly the means by which Harvey acquired a museum full of Wrightian objects. But he clearly had a plan. I think. We came to learn that with an eye to the future, over the years, Harvey managed to acquire several other houses surrounding the warehouse, including the former residence of A.D. German himself. Curiously, he had not purchased the one adjacent building that was physically conjoined to the warehouse, though he had ample opportunities. En route from the Warehouse to The Mansion B&B, our path skirted a structure housing feral cats, then past the standing stickwork of another former house, a dumpster stationed nearby. As we passed, Harvey muttered, more to himself than to us, without so much as turning his head, “It’s under restoration.” He escorted us through The Mansion B&B, which appeared to be in an exceptional state of repair for a “Glanzer” holding, until at last we came upon the inevitable bedrooms with falling plaster and cracked window glass. After the grand tour of Harvey’s malignant and odorous empire, we settled down in front of a welcome fire. Beth demurely provided tea service, then vanished in thin air, as Harvey unveiled his plot to seduce us into investing in his warehouse project. Harvey was fascinating yet deeply flawed. If personalities have facets, Harvey’s was the Hope Diamond. It took patience and tact to cautiously dampen the prospect that we might be potential investors or partners. Eventually, I was able to convey to Harvey that the A.D. German Warehouse, fine as it was, was just too daunting of an undertaking for us. It was also far from home. However, we did think that we could make something of the little Willey House in Minneapolis. After all, it was practically in our neighborhood. I asked if we might share an outline of our thoughts with him. Though disappointed, he begrudgingly consented. I prepared a draft and sent it by mail. A couple of weeks later, Harvey’s reaction to our ideas on the Willey House was surprisingly positive: “Your thinking is more in line with mine than anyone I have ever spoken to,” he said. It seemed like a compliment. But hold that thought. A few weeks after our ideas had earned his faith (apparently because they were his), he agreed to entertain a financial proposal. We prepared two. The first was an offer commensurate with the highest price of any property selling in the Prospect Park neighborhood in recent years, and the second was a little above that mark. It is important to remember, the house was a leaky, abandoned ruin with no working utilities at the time. Russ, our realtor, had both options in hand when he met to present our offer to Harvey. At the last moment his instinct told him to present the higher of the two, which he did. Harvey told Russ he’d respond shortly, and promptly paid a call on our neighbors, to see if he could get an even better price, a classic Glanzer move, that thankfully bore him no fruit. In the end, he accepted our offer. A closing date was set. Russ arranged to collect Harvey and chauffeur him to the closing, in the event he had a change of heart. A couple of days prior to consummation of the deal, realizing that the house was still packed to the rafters with Harvey’s accumulation of miscellany, and no arrangements made to remove it, we asked through Russ, when we could expect him to “move out.” This perfectly reasonable question between buyer and seller was our near fatal error. Harvey became infuriated with us and lashed out, “I thought you people would be easy to deal with!” Knowing that reaching the finish line was the only thing that mattered, we instructed Russ to inform Harvey that he could collect his possessions at his convenience, we were only inquiring. Fortunately, our submissive reaction defused the situation and got us to the closing, where we held our collective breath until Harvey put pen to the paperwork. Harvey Glanzer told us a story over breakfast one day, about visiting his children in Colorado and buying two houses on the drive home. Seeing Harvey with a substantial check in hand inspired Lynette to caution at the closing, “Don’t buy any houses on your way home, Harvey.” He appreciated her humor, and as far as we know he didn’t. He did however retain his entry key for the duration of our restoration, showing up spontaneously to periodically relocate some small portion of his stockpile of valuables. He eventually moved everything, at the rate of two or three boxes at a time, and always alone. When necessary Stafford helped him lift larger items and furniture pieces into the back of his little pickup. If Stafford happened to be on site when Harvey appeared, he’d alert me. I’d race out of the office in order to catch up with Harvey; always in hope of gleaning fragments of history only he could share. One day, he arrived in his compact pickup truck sporting a mismatched door. Harvey typically looked like he was on day five of a three-day bender, disheveled, beard crusty with dried spittle from the corner of his mouth. This day his customary, rumpled attire and trademark minimum personal hygiene were complemented by a cracked lens taped into the frame of his huge aviator frames, accessorized with a bandage adhered to his forehead. Dozing off behind the wheel, he apparently veered off road between remote destinations, but survived. Harvey made us promise we wouldn’t tell Beth. We didn’t. Surprise visit after surprise visit, Harvey was thrilled as he watched the restoration unfold, and we as his boxes gradually diminished. He was especially proud of Stafford. It’s clear now, that he was seeing the transformation in the house he could only have imagined, but never achieved on his own. Once the Willey House was in our possession we didn’t need to worry about what Harvey might pull next, instead, we relished visiting with him. He was invariably fascinated by the ongoing work as he shared nuggets of house history. Our mutual goodwill inspired him to pass on a number of historic artifacts associated with the house. Among the musty period magazines and news clippings were a set of black glazed, terra cotta Nakoma and Nakomis figurines. They had been gifts from the Wrights to the Willeys, well documented in the correspondence and evident in Hedrich-Blessing photos of the house, published in the January 1938 Architectural Forum. Clearly, Harvey invested his unmitigated faith in us, and in return, we intended to live up to his highest expectations. Harvey Glanzer had two brothers, Arthur and Clarence. In an online memorial page dedicated to his memory, a nephew recounted that he had always referred to Harvey as “Uncle Midge” due to his diminutive stature in comparison to his taller siblings, sweetly endearing for a man reviled in so many circles. The nephew remembered him for his generosity to his mother after his brother Arthur’s death. Harvey had three children of his own, all of whom lived in Colorado. Harvey repeatedly said his kids didn’t care a whit about historic preservation or his properties. He claimed they would run to the bank the moment he died. He wasn’t wrong, but it was actually more like a slow, limping foot drag, given the burden of selling ramshackle, forlorn old buildings. His son, a recently retired emergency room doctor from Longmont, Colorado, was no less eccentric than his dad. He always referred to him as “Harvey,” not “dad” or “father.” “Harvey.” Eric lived in an American castle, “The Lion and the Rose Castle,” he built for himself. It had 26 rooms and was conceived in the style of a Medieval European palace with high stone parapet walls and of course, a boulder-strewn waterfall set in a stunning mountainside location. He and his wife were impassioned advocates for animal rights. They founded a local program to neuter stray felines. As a byproduct of their efforts, they adopted a number of cats of their own, a very, very high number. After Harvey died, Eric and I spoke on the phone with some frequency. I wanted to help him pass the A.D. German Warehouse into the best possible hands, as well as preserve the Frank Lloyd Wright memorabilia Harvey recklessly stored in the warehouse—including an array of architectural models, wall-sized photo displays that appeared to be from the 60 Years of Living Architecture show and God knows what else. Through the years, the warehouse had become a bit of a white elephant in reputation. In a chronic state of incompletion only sporadically open to the public, it was considered a nuisance rather than an asset in the town of Richland Center. I wanted to help guide Eric to a suitable steward, but as was the case with his father, we usually ended up talking about cats. He and his wife adopted and cared for approximately 100 of them at the time. But, as he explained to me, “You know Steve, if you think about it, it’s really just four or five per room.” There were certain times of day when I was not permitted to call, during the hours of litter box cleaning, for instance. Eric was a sensitive soul. He truly loved his cats, knew each of them by name and temperament. He even sent me a poem of consolation after I told him we had lost a beloved pet of our own—”When the Time Comes, Let Me Go,” a bereavement poem about, you guessed it, a cat. The Willey House and the A.D. German Warehouse had a lot in common under the stewardship of Harvey. The Warehouse, like every other property Harvey owned, was plagued with persistent water problems. A sour waft of mildew hung heavy in the air. Black mold trailed indiscriminately down interior walls. The woes, caused by the intrusion of water, in league with the other usual issues of missing window glass, lack of utilities and pestilence, seemed insurmountable. Potential buyers found it distressing and their rejected offers reflected it. 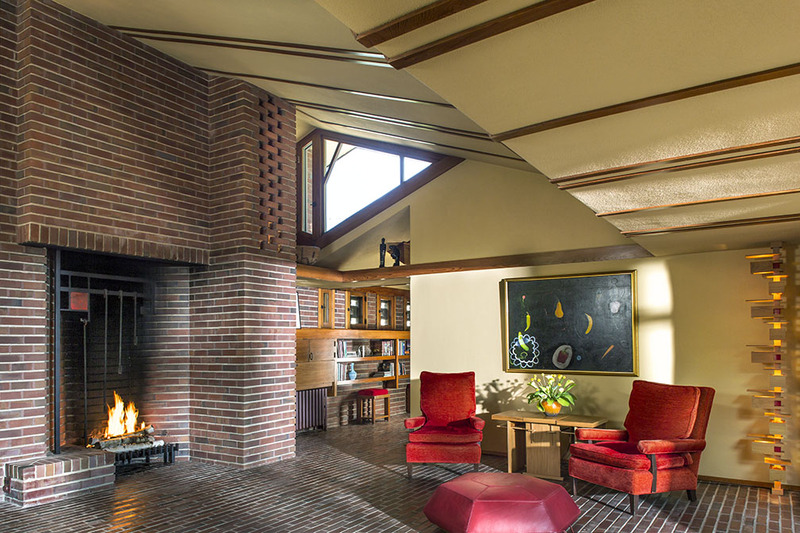 Sometime after Harvey’s passing, The Frank Lloyd Wright Building Conservancy sent an advocacy team to Richland Center, including Jack Holzhueter and the late John Thorpe. Its mission was to help convince the city fathers of the building’s cultural worth. I joined the group because of my connection to Eric. On a tour of the structure, architect Peter Rott noted that the poured concrete slabs composing the roof decking leaked simply because they needed to have the joints between them sealed. Apparently, the longstanding, root cause behind the most pressing problems on-site could have been solved with a caulking gun. No surprise really, inevitably, dilemmas entirely curable were left to fester under Harvey’s dominion. Harvey Glanzer’s circuitous career path would be a model for today’s youth, who understand that they will be switching careers as often as their parents changed furnace filters. 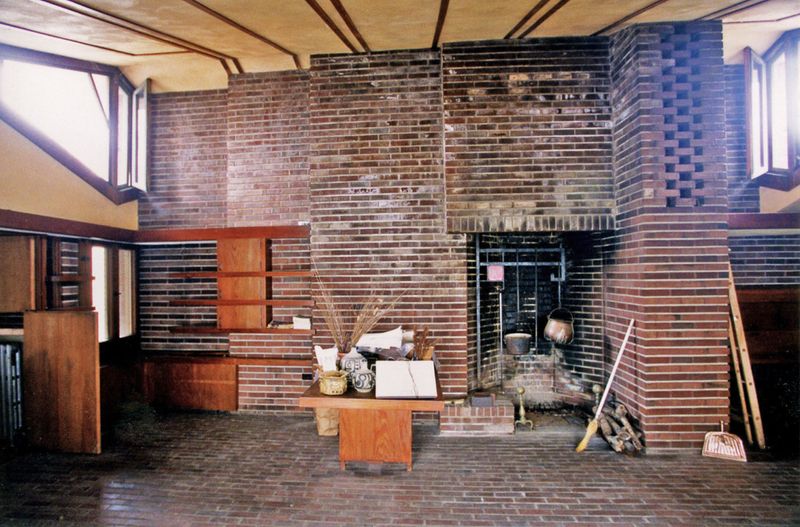 A work history, partly corroborated in Margaret Scott’s book Frank Lloyd Wright’s Warehouse in Richland Center states Harvey Glanzer was born March 18, 1916, in Cleveland, Ohio. He attended Kent State University. Upon graduation, he served with the Planning and Control of United States Ordinance Department in Ravinia, Ohio, during wartime. An example of his handiwork, a screw-top plastic vessel to hold live munitions, was demonstrated for us by Harvey in the Willey House garage. For a time after the war he opened a machine shop with one of his brothers. Harvey went on to hold positions in businesses such as S. B. Foot Company, the largest tannery west of the Mississippi. He was hired as an efficiency expert (aka “hatchet man” per Harvey) at Redwing Pottery when they were economizing. Which explains why the Willey House was full of prototype Redwing ceramics when we acquired it, all eventually reclaimed by Harvey. He was superintendent of an Owatonna Tool Company for a while, before taking a position with Craig-Hallam Corporation, a company that sent him out to “take over” failing businesses. Which apparently inspired him to launch a failing business of his own in Chicago, a cosmetic line for ”women of a certain age.” The line was called Second Debut. Harvey hired national radio personality Paul Harvey to hawk it for him. “…Paul Harvey… Page 2.” When the face powder cleared, he assumed control over an indebted Process Company, closer to home in Minneapolis. Margaret Scott makes no mention of it, but Harvey also acquired a broker’s license at some point and invested in stocks and equities. For more than a decade after acquisition of Willey, we received reams of financial paperwork in his name. After relocating to Richland Center, Harvey and Beth opened a bed and breakfast to serve the throngs who he predicted would be drawn to the Warehouse. The Mansion B&B, as it was known, was located on the same block as the warehouse. At some point he opened yet another B&B at the partially restored Walker House in Mineral Point (there is an online ghost story written about it). These were the sundry ventures I knew about. It would not surprise me at all if there were others. Harvey’s ruthlessness in business didn’t serve him well in preservation. Among Harvey’s detractors was an all-inclusive set comprising what seemed like the entire preservation community. No one could see a method in Harvey’s madness, though I think there was one. In addition, there were allegations that he misappropriated volunteer-raised funds raised for an early restoration effort. His reputation was well established. While attending a benefit dinner at the Auldbrass Plantation for the Frank Lloyd Wright Building Conservancy, introductions were being made. When a prominent Wright scholar across the table learned we were the new owners of the Willey House, he exclaimed, “You got the house away from that MADMAN!” At that moment I couldn’t help but hear Harvey’s nasal voice repeating “Your thinking is more in line with mine than anybody I have ever spoken to,” a compliment that has given me pause ever since. Sullied reputation, obliqueness, ruthlessness and occasional petulant outbursts notwithstanding, we came to love Harvey unconditionally. As our restoration proceeded we witnessed a childlike joy in him as he delighted in one accomplishment after another. We felt that we owed a debt to him. After all, he hand-selected us to be stewards of the Willey House, when he could have chosen anyone. Three owners preceded us. Malcolm Willey lived in the house from 1934 until 1963, when he retired from the University of Minnesota (Malcolm and Nancy divorced in 1955, though Nancy left prior to that). Russell and Jane Burris raised three young children in the house between 1963 and 1972. With the help of former Taliesin Apprentice John Howe, the Burrises selected Harvey Glanzer to carry the torch. They took care with their decision and chose Harvey over, among others, a realtor who wanted to paint the red bricks white. But Russell Burris confided in me that he was soon disappointed in his decision to pass the house on to Harvey. He didn’t like the way it was cared for. For 30 years, he told us, he could not even drive past his former home, he was so troubled, furious with himself, at the distress his judgment had caused to the Willey House. A building’s safety is far from ever guaranteed. Even when a “save” is accomplished, it is never a done deal. As our restoration began, all advice was worth consideration. And it was plentiful! Harvey told us that he and Beth speculated how we would deal with uninvited visitors and the onslaught of unsolicited judgments of strangers. As we soon learned, a house like this has a sort of public ownership aspect to it. And consequently, no shortage of opinions on what should be done, how it should be done, when and by whom. Harvey’s sage advice to us was this: “Listen to what everybody has to say, then do whatever you need to.” His advice didn’t seem particularly effective for him, but we found a kernel of wisdom in it. Harvey considered himself a preservationist, this despite the fact that at any given moment in his adult life he owned a dozen or so, properties that could be plotted somewhere along the distressed-to-lost continuum, every one sadly displaying broken windows, leaking roofs and a general air of must about them. In his defense, we’ve visited a few of his former properties: in Mineral Point, Wisconsin, the Walker House, now a functioning B&B, and the 1859 train depot there, transformed into a charming history museum. Also, the A.D. German Warehouse in Richland Center, long the bane of its city fathers, now poised to become the jewel in its crown. Harvey was unable to complete a restoration on any of his properties, not least of which was the Willey House. But preservation, like an octopus, assumes many strange forms. Harvey’s most successful conservation tactic was to buy and to hold. As distasteful as it may be to some, preventing an ill-conceived improvement, or postponing the wrecking ball, even while deferred maintenance takes is toll, can be considered an imperfect, but perfectly valid form of preservation, if only for the short term. And preservation victories are always short-term. One dedicated steward hands off to the next. That’s how it goes. Often, the most critical decision of one’s tenure as a building owner is selecting whom to pass the baton to. Passing the baton is something Harvey was exemplary at; running the race itself, not so much. They say the road to hell is paved with good intentions. But in the final analysis, sometimes-good intention can be a reasonable replacement for action. I believe Harvey always meant well. We noticed a pattern. Every 10 years or so, the Minneapolis Star Tribune featured an article with a headline proclaiming the imminent restoration of the Willey House. Harvey was featured in every story, each time with a different supporting cast, always poorly planned, underfunded and inevitably ill-fated. Though we had faith in our own efforts, we didn’t want to be that article, and shunned publicity. We maintained a low profile until the job was done. I guess we still haven’t promoted the house locally because, after all, something could still go wrong. Reminiscing over Harvey makes me reflect on what I’ve learned in the past 17 years regarding historic preservation. Despite our best efforts, and the arsenal of regulatory tools available to us, a building’s safety is far from ever guaranteed. Even when a “save” is accomplished, it is never a done deal. Instead, it follows in a cycle of events, uncertainty, crisis, resolution, relief, celebration, then repeats itself. A building saved one day can be lost the next with surprising alacrity. Preservation heroes come in unlikely forms, such as the bulldozer operator who arrived at the David and Gladys Wright House with orders to take it down. His better judgment caused him to question the command. Thanks to one man’s inaction, that remarkable house stands today. True to form, as I write this, the David Wright House needs to change hands once again, and again is desperately at risk despite a princely listing price. This, a sad fact. Simply due to its diminutive scale and a highly desirable location, it finds itself in the crosshairs of developers, the worst preservation scenario imaginable. Despite its pedigree, only the right handoff will protect this marvel of concrete block engineering for another year. An unfortunate case in point, the Richard Neutra-designed Maslon House, a landmark, situated on the Tamarisk Country Club, founded by Jack Benny in Rancho Mirage, California. The son of a law partner of the original owner charmed the family of Samuel and Luella Maslon into selling it for $2.45 million in 2002, only to reduce it to a pile of rubble in a matter of hours in order to make way for a garish fairway monstrosity that no one will ever miss when it suffers a similar fate. The handoff is everything. Thank you for the Willey House update. Congratulations to you and your special restoration group! However, I note an “error” in paragraph 2. You state: “Harvey, we believe that you will be very proud to see the Willey House restoration is completed at last!” That was a very modest understatement to cover 65 months of creative restoration. You have set a whole new standard for both owner and professional historic preservation restorations. I’m proud and happy with the results. I’m sure FLLW would add his approval. Harvey’s uncharacteristically sentimental acknowledgement of our success was the most gratifying award that we could have ever had asked for. We never did see him again. Harvey was in and out of the hospital with increasing frequency in his final years. [He died in 2011 at age 94.] Wherever he may be right now, loathed or loved, Harvey Glanzer played a critical role in the ultimate preservation of and deeper understanding of the Willey House. To him, we remain forever grateful.